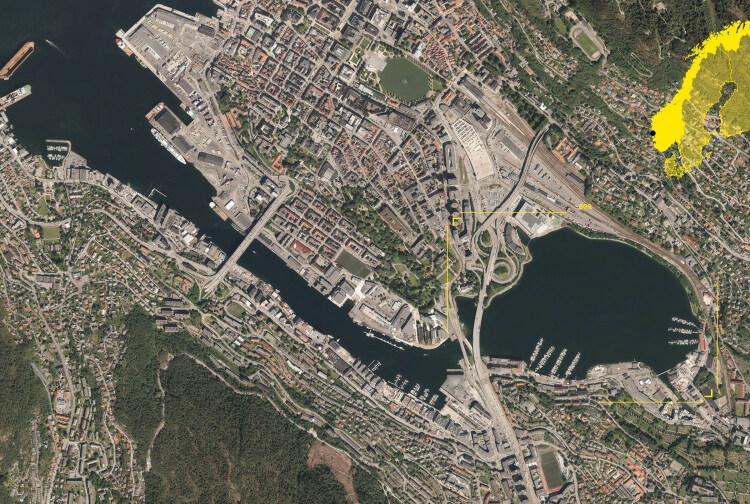 The development of the municipality of Bergen the next 100 years will be governed by the need to have a geographically concentrated daily business. As the oil decreases, the price of this increases dramatically. Thus, energy costs push forward changes. Through the requirements of users, some areas will crystallise where there is possible to live; enclaves where it will be possible to both work, live, have kindergartens, schools etc. These areas will experience a large-scale densification at the expense of more peripheral areas. The enclaves must be optimized in order to operate as independent cities. One must strive to achieve a programmatic balance, a 1 to 1 relationship between housing and jobs. But first and foremost, it must be made plans for how a densification can happen. Bergen must make a dramatic change in relation to the normative provincial development which is still actively going on. There must, on the basis of a need for new and more highly densified urban areas, be worked up specific plans for how a densification of the city’s central areas will happen. In this context, the need to redefine the role of the planner should be emphasized. To ensure that future planning processes can handle environmental challenges and constant changes in social structures, new alliances and tools should be adopted. A dynamic planning that crosses professional and interest-related divisions, and which to a higher degree seeks to define local challenges and solution models, can ensure the diversity within the planning discipline that is needed to reach socially responsible solutions. It may prove to be conflictional being practitioners within an open landscape where the regulatory framework for the subject is constantly changing, but it is this landscape we must now begin to familiarize ourselves with.